All Cabinets Are 22 Gauge And Powder Coated And All Sink Bases Are 25 In. Deep And Sink Bowls Are 7.5 In. Deep. 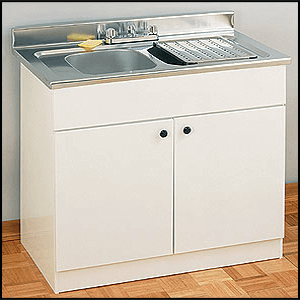 Also Available (Sold Separately) Drainboard For Counter-top. The Depth of the Unit is 25 In. The Height Of The Unit Is 36 In. You can design your own style. All cabinets are made of heavy furniture steel and are powder coated to last. All counter tops are made in stainless steel. They will out last all wood cabinets and have no toxic chemicals. *Fully Insulated Doors * *Reinforced triple Bent Shelving* *All Cabinets Are 22 Gauge And Powder Coated And All Sinks Are 7.5 In. Deep*Normally Ships in 1-2 Business Days. Discount Available For Product and Shipping For Large Orders.